The shortlists for the UK's Carnegie Medal (books for readers aged 10 and older) and the Kate Greenaway Medal (picture books). Winners will be announced on June 26th. The Jane Addams Children's Book Awards, for books that "address themes or topics that engage children in thinking about peace, justice, world community, and/or equality of the sexes and all races. The books also must meet conventional standards of literary and artistic excellence." The E.B. White Read Aloud Award. The Nebula Awards, sponsored by the Science Fiction & Fantasy Writers of America. Sandra Boynton's beloved counting book Hippos Go Berserk! was first published some thirty years ago, and while some new hippo-starring books don't quite reach the Boynton level of inspired insanity, they're appealing in their own way. They do tread some of the same ground, but surely there's room on the shelf for more hippopotami. Key Porter Kids, a Toronto-based outfit, has published a series of board books—One Hippo Hops, Hip Hippos, and Sad, Mad, Glad Hippos—with simple rhyming texts by Jane Yolen. 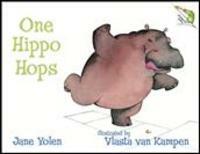 The first one, a counting book, begins, "One hippo hops. Two hippos jump. Three hippos jog. Four hippos bump." Gosh, now I've given away almost half the plot; there's only one sentence per sturdy page—which is just right for babies and toddlers, of course. Illustrator Vlasta van Kampen's lovable animals are the best part of the series. She uses watercolor to give her hippos depth and dimension. It's a fat, happy bunch (except in Sad, Mad Glad Hippos, which concerns feelings), whether they're crowded onto a sled in One Hippo Hops or trying on green dresses Hip Hippos (about colors). Lounging near the beach and batting her eyelashes at two fishermen, a hippo mermaid (in Hip Hippos) is priceless. The series would make good birthday presents for very little people, and if you really want to get hippo-crazy, you could add to the box such classics as Veronica, George and Martha, and You Look Ridiculous Said the Rhinoceros to the Hippopotamus. Earlier in the fall the proprietor of AskPatty.Com, which dispenses "automotive advice for women," mentioned her top ten children's books about cars. I was thinking about that list this week because I need to buy a baby shower gift. #1 on Patty's list is the classic Cars and Trucks and Things That Go, one of my son's all-time favorites. I'm going to include that book in my shower package. My friend MJN reminded me of the car list; she blogs at The Alternate Side Parking Reader, which concerns the adventures of car ownership in New York. And if you think that squabbles over parking places don't get ugly, then read the post "Spot of Guilt." Whew! You'll find an article about the awards at the Pittsburgh Post-Gazette. Happy Hanukkah, y'all! The 8-day/8-night Jewish festival of lights begins this evening. My holiday reading recommendation is My First Chanukah, a sweet board book by Tomie dePaola. I like the card catalogue description, which I found on Amazon: "Describes the traditional celebration of Chanukah, including the lighting of candles on the menorah, the eating of latkes, and the spinning of the dreidl. On board pages." Latkes are potato pancakes, traditionally served on this holiday. Delicious! If you have a favorite Hanukkah book, leave a comment, and I will add it to this post. Update: The suggestions are rolling in. Bruce recommends Eric Kimmel's Hershel and the Hanukkah Goblins and Steven Schnur's Tie Man's Miracle. MotherReader praises The Borrowed Hanukkah Latkes, by Linda Glaser, which Elaine reviewed recently. Elaine points out two other titles by Eric Kimmel, The Magic Dreidels and Zigazak! A Magical Hanukkah Night. She also has good things to say about In the Month of Kislev, by Nina Jaffe; Hanukkah Lights: Holiday Poetry, an easy reader compiled by Lee Bennett Hopkins; Chanukah Lights Everywhere, by Michael J. Rosen; and a nonfiction selection, The Christmas Menorahs: How a Town Fought Hate, by Janice Cohn. Thank you to blogging pals Bruce, MotherReader, and Elaine for your excellent contributions. Farm School's Becky cites the All-of-a-Kind Family books for their Jewish traditions, including Hanukkah, and her own family enjoys Hanukkah Lights, Hanukkah Nights, by Leslie Kimmelman, and Shira's Hanukkah Gift (a.k.a., Kugel Valley Klezmer Band), by Joan Betty Stuchner, too. Gracias, Ms. Sharp, for your list. On the third day of Hanukkah, a shout-out goes to Jennifer, for recommending Hanukkah, O Hannukah, by Susan L. Roth; Elijah's Angel: A Story for Chanukah and Christmas, by Michael J. Rosen; and There's No Such Thing as a Chanukah Bush, Sandy Goldstein, by Susan Sussman. The fourth day brings some light from the blog Seven Impossible Things Before Breakfast, where Julie considers a brand-new version of I Have a Little Dreidel. On the fifth day, we rested. No, we didn't! Because there were more books to read, from Wendy's Hanukkah bibliography at Notes from the Windowsill to Heather's recommendation of Eric Kimmel's Chanukkah Guest, at FeatherBee. And, finally, Genevieve suggests Stephen Krensky's Hanukkah at Valley Forge. In the comments, Genevieve writes, "It tells the story of George Washington meeting with a Jewish/Polish soldier who was lighting a menorah, and discussing with him the parallels with the Revolution -- another battle against a tyrant, by an outnumbered group." Every year Beginning with Books, a Pittsburgh literacy organization, convenes a panel of experts who recommend new titles for babies and toddlers. Karen MacPherson, of the Scripps Howard News Service, wrote a feature about the latest selections, all of which were published in 2005. February is Black History Month, and the Book Buds blog honors it well with this roundup. The Brooklyn Public Library offers another good one. A terrific starting place for searching out titles by and about African Americans is the Black Books Galore! series. Four guides, chock full of suggestions, can be found at your library, bookstore, or online at the Black Books Galore! web site. The first one alone mentions more than 500 of "the most positive, best written, and most acclaimed titles available," according to the site. If you saw the recent 4-part PBS special "African American Lives," you know how good it was. If you missed it, the shows are now available on DVD. Insist that your library order these. The affable Harvard professor Henry Louis Gates talks to prominent African Americans like Oprah, Quincy Jones, and Chris Tucker, and helps them trace their family roots. The horrid institution of slavery, and its devaluing of human life, make such searches difficult, but Gates and his researchers persevere and come up with astounding personal histories. Using information gleaned from new DNA technology, Chris Tucker even travels to Africa to the area where his ancestors lived. Above all, the series emphasizes the heroism and triumph of ordinary people. Highly recommended for older children, especially teens, and adults. Last summer we were batting around ideas here for books for babies. A reader (and the newly minted blogger & bookseller at Book Carousel) recently chimed in with some more recommendations, and I didn't want the rest of you to miss them. To see them, click on the old Chicken Spaghetti post "Books for Babies: Reader Input Wanted!" from August, 2005. Junior announced yesterday, "Me and Elizabeth hate November." (Elizabeth is a dear chum of his.) Why? I asked him, thinking he'd say something about the dreary weather. "Because there's no Halloween and no candy, and we don't like that." So, there. Here's a happier way to look at the eleventh month of the year, although it still doesn't involve sweets: November is National Adoption Awareness Month. Manhattan's Spence Chapin social services agency operates a Book Nook online, with suggested titles for babies through teenagers. One of the recommendations is The Best Single Mom in the World, by Mary Zisk. The author is profiled by a Princeton, NJ, newspaper today. Given their creativity and focus on books, I enjoy reading several homeschool blogs, even though we're not homeschoolers ourselves, and Hopewell Mom School is one run by a single adoptive mother.